IT’S ‘GLOW IN THE KNIGHT’ TIME! 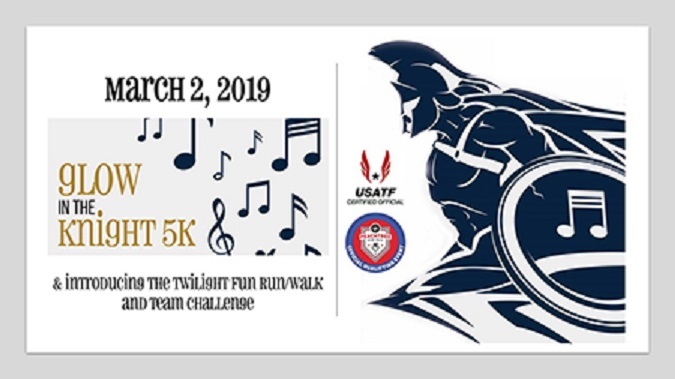 Come join the River Ridge High School Band on March 2nd for our 2nd Annual 5K run. We have a new, USTAF certified course. We added a Twilight Fun Run/Walk and a group challenge this year, so there is a little something for everyone! You get awesome race shirts and spectacular custom medals for top runners and in age groups. Best of all, you will participate with lots of great folks! Register by February 14th for a guaranteed race shirt. 100% of the proceeds go to the RR Knights Band program. Grab your gear and Come RUN and GLOW with us! We thank you for helping to insure the future of our band program and bringing music into the lives of our kids through your participation. Parking is behind River Ridge High School, adjacent the stadium. Races start and finish on the track inside the stadium.